← September’s bounty at the farmer’s market…. 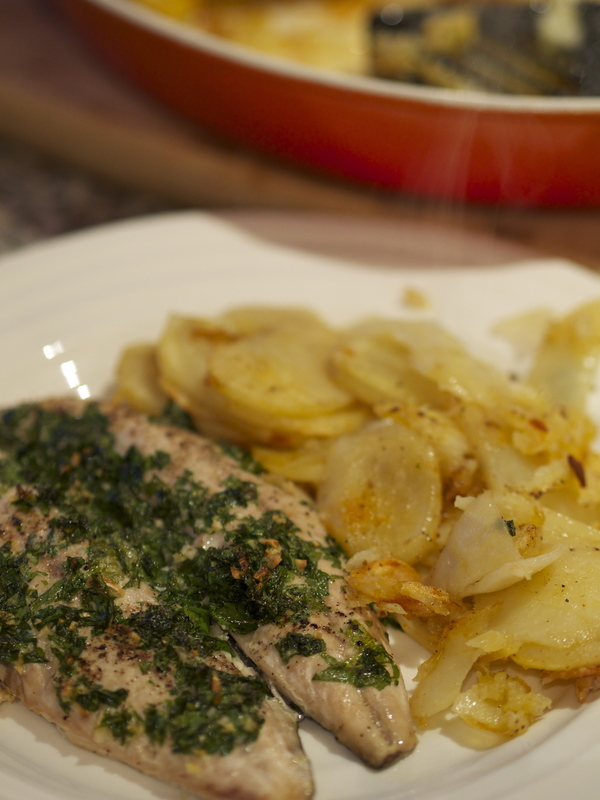 The best mackerel recipe ever……. Last Saturday I bought two of the most perfectly fresh mackerel at Penshurst farmer’s market from my favourite Arcade Fisheries, got Paul to fillet them, carried them home and cooked this. It’s an adaptation of an old Marcella Hazan recipe from her second Classic Italian Cookbook, and is food fit for all the gods. If you’ve never tried mackerel then this is the way to cook it – if you love the fish, this will go to the top of your list of ways to serve it. As this recipe cooks in the oven, it avoids lots of fishy smells through the kitchen – something that puts some off cooking such a strong fish. And all you need is a green salad and a bottle of a good white wine – once again my favourite Ortega from Biddenden Vineyards was a perfect match. Preheat the oven to a very hot 220C/fan oven 200C/gas mark 8. Cut the potatoes into very thin slices – use a mandolin if you have one. Toss them together with half the oil, half the garlic, the bayleaves, paprika and plenty of seasoning so that they are coated in the oil. 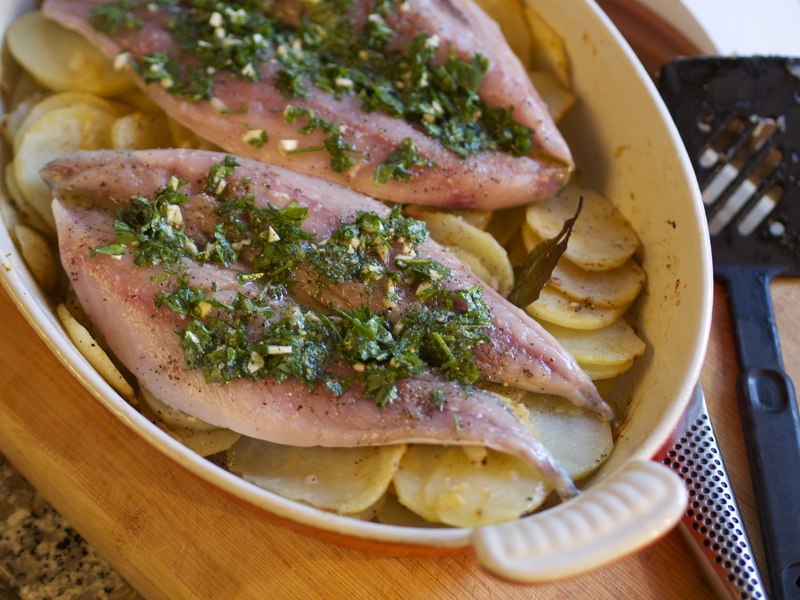 Arrange evenly in the base of an oiled cast-iron gratin dish (I use a favourite old Le Creuset) or a heavy duty roasting tin that will fit both fish flat on top. 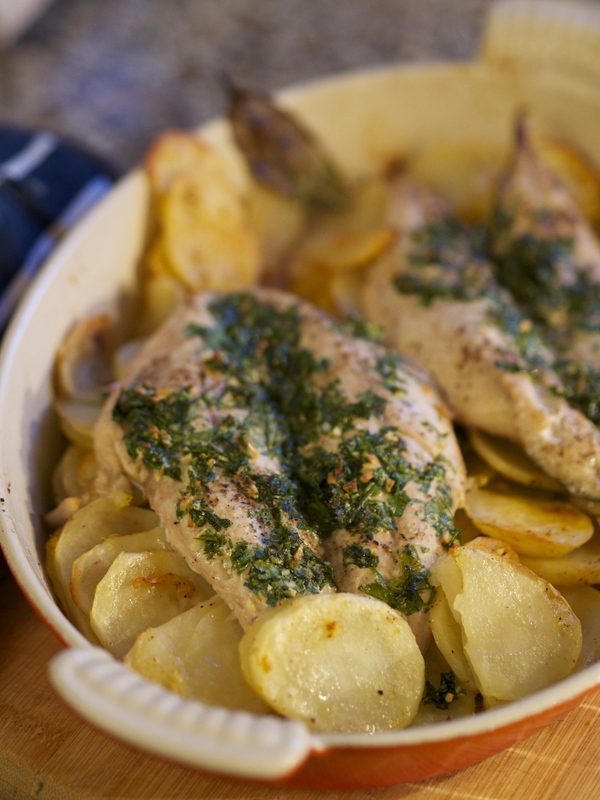 Sprinkle over the wine and bake for 15 minutes until the potatoes are half cooked. Remove the dish from the oven and arrange the mackerel on top, skin side down. Mix together the remaining oil, garlic and parsley and spoon over the fish flesh. Season and return to the oven for a further 10 minutes. Remove again and loosen any potatoes that have stuck to the sides and push some of the ones nearer the middle under the fish out to the edge. Return to the oven for a further 5 minutes or so until the fish is tender and the potatoes crisping up. Serve from the dish. 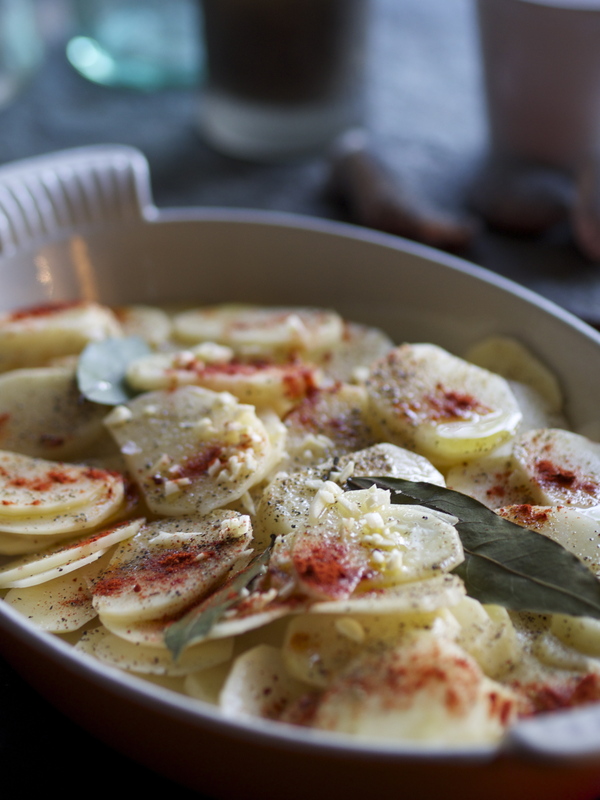 I sometimes add sliced red peppers to the potatoes for a wonderful addition but it is lovely just simply done as above. I have also done the dish very successfully with sardines or a firm fleshed fish such as cod or my new favourite, brill. The secret is to use the very freshest fish and other ingredients and cook at a very high temperature or the results can be greasy. This entry was posted in Farmers Market, In season, Recipes, Uncategorized and tagged Arcade Fisheries, biddenden vineyards, cooking fish, farmers market, Mackerel recipes, Marcella Hazan, Ortega. Bookmark the permalink.